^^From the American inspirational singer best known for his work with the Gaithers, this is a fine CD expressing what God is saying to so many across the globe. The first line from "With His Love" is almost word for word the same as I had just read on a couple of people's weblogs. There truly isn't a track on the whole CD which I would really criticise though, lyrically, I think I may have missed the point of the title track. I can't quite see where he is coming from on this. Every one of the 11 songs here sends the glory back to God, helped out by a well crafted Nashville production. Lyrics are often insightful like on "Long Time Coming", which starts off questioning the whys of life but ends up with the knowing that it's a long trek and God is in charge. This is very much a CD that will stay on our stereo for a long time. Here's hoping the UK gets hold of this young man and gives him the credit and recognition he deserves. 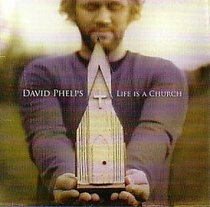 About "Life is a Church"
Customer Reviews For "Life is a Church"
David Phelps is amazingly gifted. I have all his CDs and never get tired of them. This one is a little different to his others but the more i have listened to it, the more i enjoyed it.